I bought it cheaply by table tennis navigation. I felt it was harder than SK 7 but harder than Fortius ST.
Ryuki （Experience：４〜５ years）	As expected. If you long for Niwa 's play, this. Easy to use any play. I applied various rubbers and tried it, but after all, the victas rubber is the best! From me, I recommend buying light individuals and putting extra. 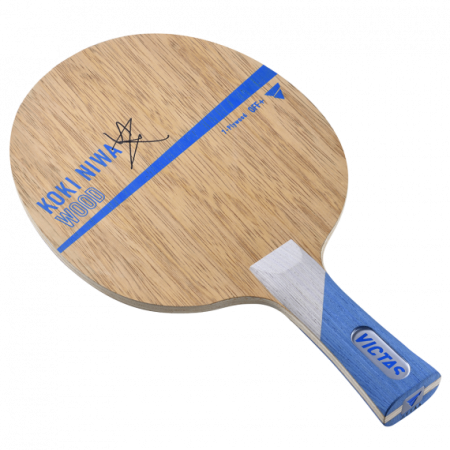 We changed from Timobor ALC to 85 grams Niwa Takaki Wood. So compare with it. The trajectory of the drive bang and the running of the ball are close to the outer carbon racquet. However, there was no sense to fly freely, there was a shot feeling like hitting with my own power firmly. So over mistakes, such as when we struck down in the front team, decreased. The shot feeling is really wonderful. It was a thing I was seeking. Since the design is cool, it is cool, put on v15 EXTRA and let's be cool. I bought it with a combination with Taka Niwa. I heard that it is easy to fail with a hard racket × a hard rubber, but it was not even there. Even if you strike lightly, it will return normally, and even if it is driven, it will hit back and return with the same power as the counter. I'm glad I bought it. As the racket itself was a little harder, I felt both power and stability just in person, together with a rubber of medium hardness. The platform, the block, the counter are quite easy to do, but when you hang it from yourself a pretty flying distance comes out so I think that the first one will be a bit painful.